It’s Memorial Day and while most of us will be enjoying a picnic, let’s not forget what this day is really meant to celebrate! Thank you to all the veterans who have served and protected our wonderful country. This morning, we headed over to Main Street to watch our town’s Memorial Day parade. There was a huge turnout of residents and it was great to see everyone coming out to honor our Veterans! I love making breakfast on the weekends since we usually eat a quick breakfast at school and work during the week. I saw a picture of this recipe in April 2012 Eating Well magazine (thanks Juliette for the subscription!) I love the magazine and I’ve already marked a few new recipes to try out in the two issues I’ve received. These oatcakes were perfect – not to sweet and more on the savory side. 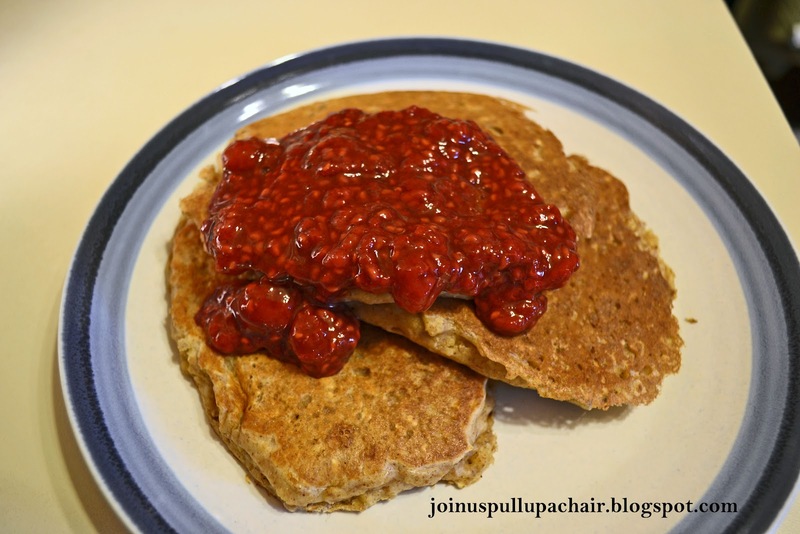 The raspberry compote was tangy and added just the right amount of sweetness to the oatcakes. Madeline didn’t care for the compote, but she gobbled up the oatcakes. I loved the chewy texture of the oatcakes and made for a nice change from traditional pancakes. In a medium bowl, whisk together the buttermilk and egg. In another bowl, combine the remaining ingredients until well combined. Add the dry mixture to the wet mixture and let stand for 15 minutes. The mixture will bubble while it sits. While the oatcake mixture is sitting, prepare the raspberry compote. In a small saucepan, add the raspberries, honey and cinnamon. Bring to a simmer over medium heat and cook, stirring occasionally. The berries will begin to break down. Remove from heat and cover to keep warm. Heat a griddle or large skillet to medium heat. Coat with cooking spray. Spoon 1/4 cup of batter for each oatcake, cook until bubbles dot the surface (about 2-3 minutes) and then flip and continue to cooking until browned. Continue this process with the remaining batter until all is used. Serve the oatcakes with a dollop of compote. Enjoy!